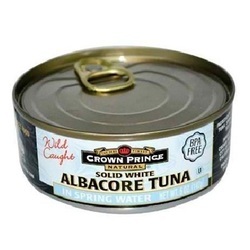 Solid White Albacore Tuna is considered the highest quality tuna available in a can. The meat is light in color and firm in texture without a lot of sediment. One serving of Albacore Tuna provides about one-third of the daily needed protein with very little fat. Our larger sized cans are perfect for feeding the whole family a low-fat, nutritious meal and are available with or without added salt. Try some in your next casserole, salad or sandwich.